This trip offers special features or exclusive opportunities unique from standard IMR experiences. If adventure is what you are looking for this is a trip not to be missed! Exciting times await on this once-in-a-lifetime experience. This trip includes not one but TWO safaris as there are so many special animals to see including white lions, hippos, lions, elephants, ostriches, giraffes, zebras and much, much more! Enjoy food at a traditional South African Braai where selected barbecue meats and chakalaka sauces tempt any pallet. Walk along the famous boardwalk where the Durban beaches come alive with world-class surfers taking on the giant waves or take a dive or watch the sunrise on this beautiful promenade. The team will also enjoy local Cuban eateries, curry houses, and oceanside dining where the flavor of Durban comes in full swing! The team will visit a local Zulu tribe where homemade handicrafts, dancing and traditional zulu celebrations will take place with your participation. The South African people are so very warm and friendly and oh so appreciative of us for traveling the great distance to their lands. They recognize the great effort that we make and are extremely grateful for your help. You will have the opportunity to visit the world famous soccer stadium and some team members may choose to do the zipline where they will freefall 80m into the stadium (not included in trip price) - The Big Rush Big Swing has been officially named the world’s tallest swing by the Guinness Book of Records! Whether you want to take in a rugby game or spend some time shopping, this city has everything to offer. Twenty years into South Africa's democracy public health issues remain a challenge in epic proportions. While the public health system serves a large part of the country, it is largely underfunded and under constant strain. The system is a two-tiered system wherein large portions of people have no access to healthcare. Cultural views on health and varying levels of wealth and education influence access to and acceptance of public health services. The team will be working is several wonderful communities comprised of refugees, tribal peoples, rural communities and slums with no current access to care. Almost everyone who lives in these areas is poor, and some live in abject poverty. Children sometimes come to clinic as the head of their household because parents may have passed away or are otherwise ill. Healthcare is a main concern and the communities the team will be visiting are certainly part of the challenge faced by this country. While you will see the common respiratory infections, wounds, diabetes and hypertension, you will also see lots of impact from HIV, which continues to be devastating. The rampage has created lots of orphans and single parents. The need for community education is great; with many willing students there is a great likelihood of creating lasting change. Wake up in the stunning Valley of a Thousand Hills at your 4-star hotel nestled in the beautiful Hillcrest region right outside of Durban. This area is renowned for its acclaimed restaurants, cafe bars, shopping centers and golf courses. After clinic, rest in one of the lounge areas or at the hotel swimming pool. The hotel includes a refreshment station in your room. Comfortable rooms with private bathrooms offer private space for personal time after hours to rejuvenate. Rooms for families and couples are also available, and we will match your rooming requests if you are traveling with friends. The team will eat breakfast and some dinners in the hotel restaurant while lunch will be served at the clinic sites. Enjoy this beautiful accommodation on this special IMR Trip. TWO SAFARIS! ZULU DANCING! MANDELAS CAPTURE SITE! BRAAI AND MUCH, MUCH MORE! The team will have the opportunity to visit two very special safari game reserves in this region! Last year IMR spotted rhinos, giraffes, monkeys, ostriches, gnu (wildebeests), hippos, and African buffalos (which look similar to Asian water buffalos, but are not directly related)! One of the reserves is home to the famous white lions where you can get within feet of these beautiful wild animals. 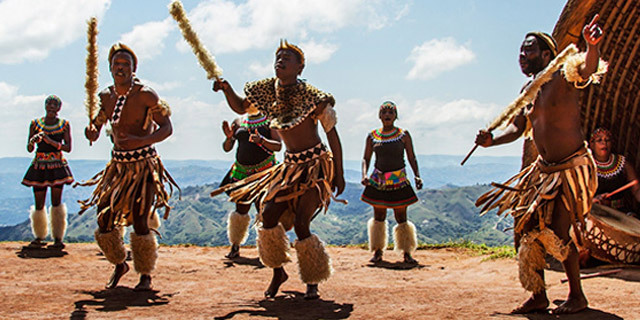 The team will also be able to visit the very famous Phezulu Zulu village where the world famous Gasa clan has over the last 30 years, allowed visitors to Phezulu the opportunity to savor the taste and feel the rhythm of Africa. Visitors are taken into traditional beehive shaped thatched huts, where the various artifacts, beliefs, and rituals are explained, giving foreigners an insight into the fascinating Zulu culture. The team will experience the humble site of Nelson Mandela's Capture, where the internationally recognizable sculpture stands. As one of the historically important moments in the struggle against Apartheid, a marking of the site was needed which has now been realized and erected. The team will get a true taste of South Africa with a traditional Braai, the typical South African barbecue complete with a wide selection of meats and the famous Chakalaka! Durban itself is a world renown beach town and home to some of the biggest waves and surfing competitions in the world. Take a stroll along the boardwalk for a chance to witness local surfers taking their chance on the big waves. We've included some photos from the team on the link to IMR's South Africa album on Facebook here, https://www.facebook.com/pg/InternationalMedicalRelief/photos/?tab=album&album_id=1200728993292014! Enjoy! You're venturing around the globe, have you considered extending your stay a few additional days to visit some of South Africa's top spots? Join IMR on an exclusive three-day extension! Kruger National Park is one of the most sought out sites in South Africa, and one of world’s most diverse Safari destinations. With over 130 mammal species and 500 kinds of birds, a trip to South Africa is not complete without a visit to this beautiful park. Come along with us on this exotic animal adventure! This country is as culturally and geographically diverse as its eleven national languages, which represent a societal melting pot of indigenous Africans, Indian immigrants, English, and Afrikaners. On this 3-day adventure, discover the Kirstenbosch Botanical Gardens, panoramic views of the southern tip of Africa and visit with penguins at Boulders Beach Park. You and the team will fly into the Durban International Airport in Durban, South Africa on June 29th and transfer to the Valley Lodge - your resort for the duration of your stay. There, you will stay the night and have a team dinner that evening. The required arrival to your hotel is 5:00pm on June 29th. If you are flying on an IMR group flight your airport transportation will be provided for you. If you have booked independently and want to be included in the airport transfer, please contact us. Wake up to breakfast provided to you at the hotel and attend the required team orientation to further prepare you for clinic! Your team leader will assign your roles for clinic, go over our clinic protocols, and discuss the communities you will be serving. After orientation, you and the team will go to a nearby game park for a safari at dusk! You and the team will travel to various clinic sites each day. You will be working in several areas - varying from refugee communities to tribal communities, rural areas and slums without little to no access to health care. You may get the chance to participate in a few homes visits serving elderly individuals to provide well care to the members of their family. After closing clinic, you and the team will go back to your hotel for a team debrief and depart for various tours. You will have opportunities to visit Nelson Mandela’s capture site and enjoy the many cuisines South Africa has to offer. July 6th, 2019 - Safari Day! Wake up to breakfast at your hotel in Durban then drive out for another Safari! Both safari days are included in your trip and we can guarantee you will see at least two of the Big 5. Keep an eye out for the albino lions!! Depending on the time your plane leaves Durban, you will be able to enjoy breakfast at the hotel and continue to explore the city on your last day in South Africa! Pay 2,475 and complete your application to secure your place as a TEAM MEMBER! Pay 2,475 of the total cost by the Early Bird date AND upload/complete all of your required documents and forms receive $200 off the cost of your trip. To confirm your space on the team: Pay 2,475 of the total cost AND upload all of your required documents and forms! Pay 2,475 of the total cost AND upload all of your required documents and forms to be eligible to fly on the international group ticket. YES - We need your help to take IMR supply bags internationally to South Africa! Take 2 supply bags for IMR both ways to South Africa.